PR30MB- "B" BRAMPTON FORK ASSY.- $4865 with all the parts I make. See photo 1, top left. IN STOCK. PR30MB complete- "B" BRAMPTON FORK ASSY.- $5420 including the "additional parts" I don't make. IN STOCK. Photos 2,3, & 4. 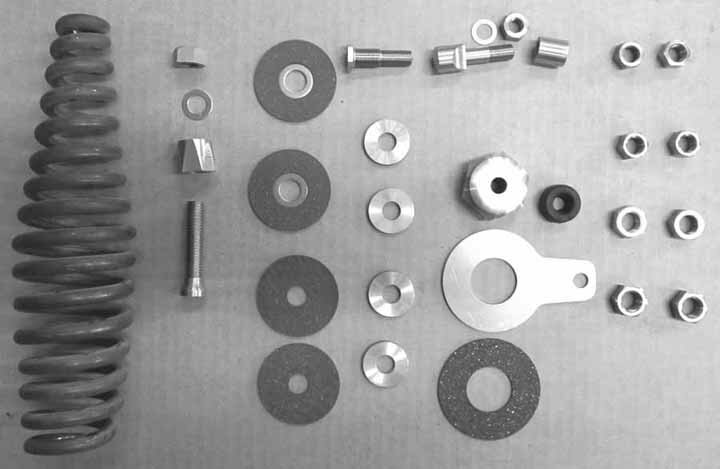 Photo 5 shows the "additional parts" made in the UK. I run a set of these on my "C" Shadow. The vast majority of the parts I make are on my own bikes. The motorcycles I ride. Heavier wall tubing and stonger 4140 steeel castings than OEM or retubed forks. 3 pounds heavier than OEM. Upper and Lower Fork Trees, along with the 4 Fork Links, and the FT227 screws, are heat treated 4140 chromoly to Rockwell 40C. All of the parts I make for the Series "B" Brampton Fork, see listings below. Itemized parts list available by email. Unfinished parts or kits are not available for sale. No need to inquire. FT208AS - BRAMPTON FORK GIRDER - These will only be sold with complete forks. My reproduction part shown. The OEM Girder is 8 1/2#'s, mine is 10 3/4#'s. 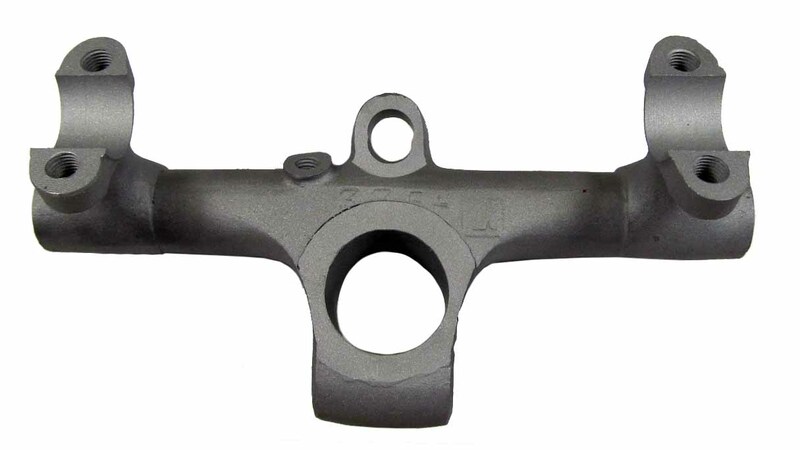 Lost Wax, 4140 Chromoly steel castings give great detail and strength and are more dense than sand castings. The DOM, 7/8" swaged to 5/8" rear tubes and the DOM, 3/4" swaged to 5/8" front tubes have significantly thicker walls and weigh more than the 1/16" walled OEM tubes. Unfinished parts or unfinished parts kits are not available for sale. No need to inquire. 45 degree countersinks. Raised B20 is evident. 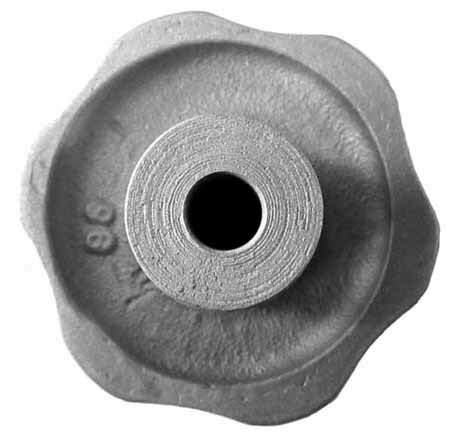 Bronze casting as per originals. Later "B" version. 2 used, Twins and Singles. Raised B20 is evident. Bronze casting as per originals. Raised F55 and the original surface texture. Early series B. 45 degree countersink. Surface texture as per originals. Cast 4140 chromoly steel. Later C's. Surface texture as per originals. Cast 4140 chromoly steel. 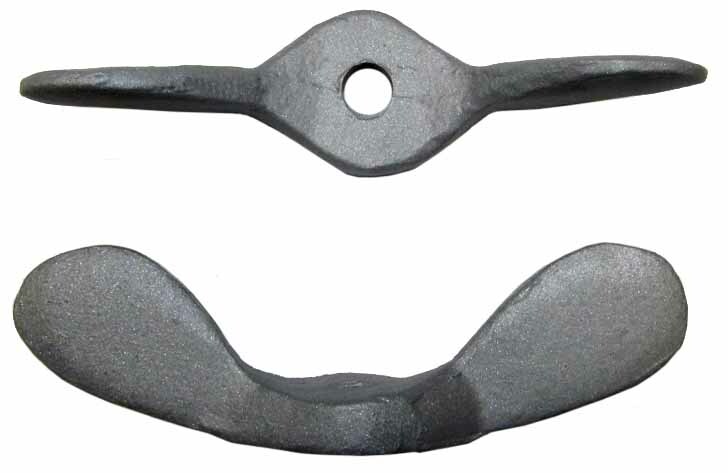 FF31AS - BRAMPTON Series A Handlebar Riser, 1" - $75 each. 2 used on Series A Fork Upper Triple Tree. For 1" handlebars. 2 used on Series A Fork Upper Triple Tree Riser. For 1" handlebars. 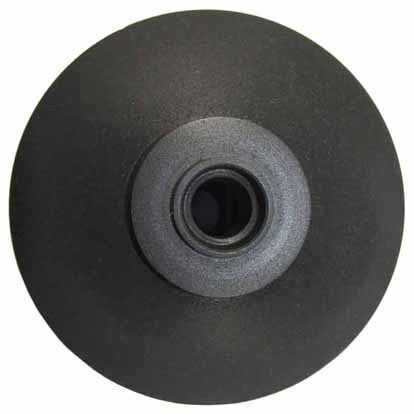 FT188 - BRAMPTON Series B FORK DAMPER KNOB- $50. Aluminum, 3/8" x 26 CEI. With set screw. Aluminum Knobs were used after the pre-war Bakelite Knob stocks were depleated. 5/16" x 26 CEI threaded hole. 2.7" overall length. Heat treated 4140 chromoly steel to Rockwell 40C. Top part is one of mine. Lower left is OEM. Lower right is a recent, sand cast, reproduction from the UK. FT207S - BRAMPTON FORK STEERING COLUMN ASSY. - $475. These are 150 gms. heavier than originals. 2 drilled grease fitting bosses. Fitted bronze bushings. Heat treated, Lost Wax, 4140 Chromoly steel casting with a DOM tubing stem. 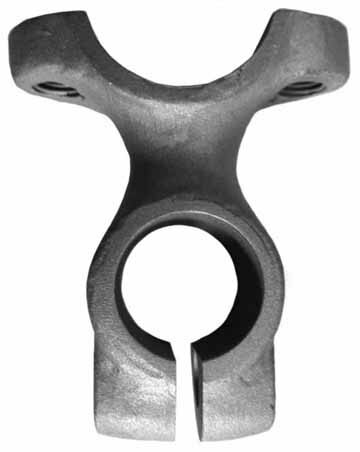 FT210S - BRAMPTON Series B FORK HEAD CLIP ASSY.- $400. Use with 7/8" handlebars. 1 drilled grease fitting bosse. Fitted hard bronze bushings. Heat Treated 4140 Chromoly Steel to Rockwell 40C. Not sand cast mild steel. FT210SA - HEAD CLIP, Series A Brampton Forks - $315. Use with 2 each FF31AS Risers and FF31A Riser Caps. For 1" handlebars. 1 drilled grease fitting bosse. Fitted hard bronze bushings. 4140 chromoly steel, heat treated to Rockwell 40C. NOT sand cast mild steel. Top part is one of mine, cast with 0.125" characters. Middle right is UK made flat bar steel (not a casting) cut to shape and hand stamped with modern 0.250" characters. 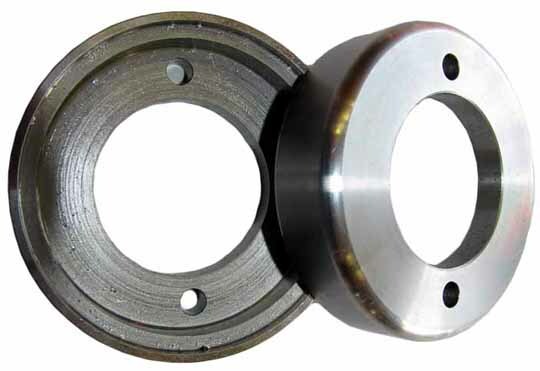 Bottom is OEM, cast with 0.125" characters. 3 3/8", 7/16" CEI LH thread. 3 3/8", 7/16" CEI RH thread. FT218 - BRAMPTON FORK SPINDLE, Top- $40. 7/16" polished drill rod, 2 used. Nuts actually thread on without galling. 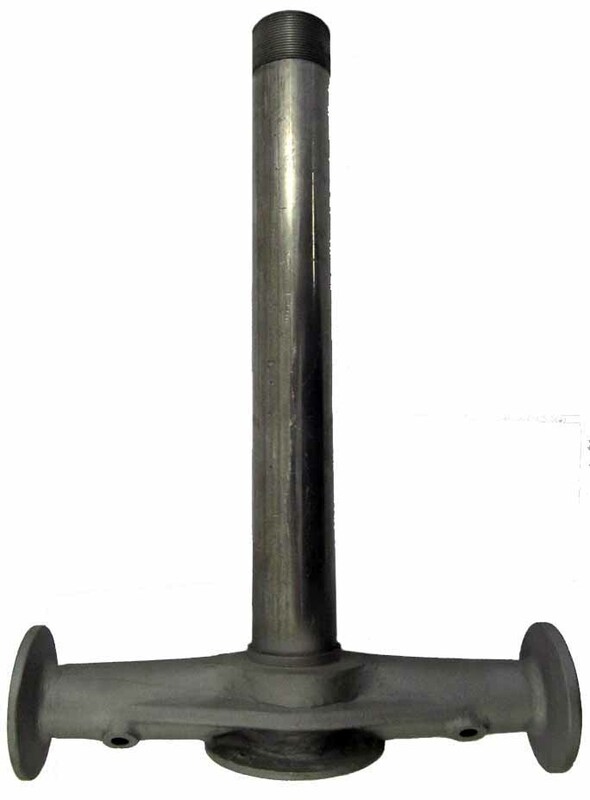 FT219 - BRAMPTON FORK SPINDLE, Bottom- $40. 1/2" polished drill rod, 2 used. Nuts actually thread on without galling. Brampton Twins and Singles. Polished and Chromed as per originals. Photo isn't very good but the parts are nicely plated. 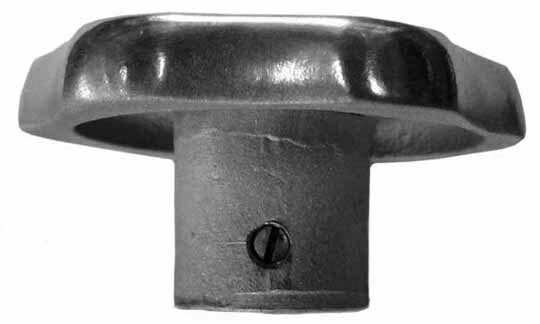 FT225 - BRAMPTON Series B FORK STEERING DAMPER KNOB- $50. 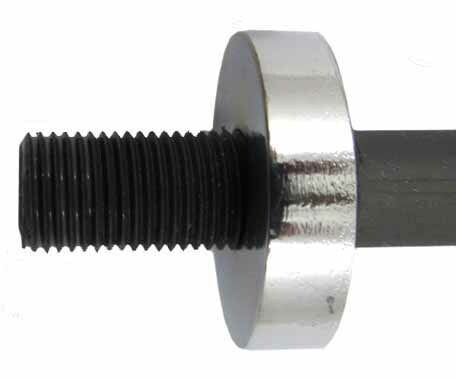 FT227C - BRAMPTON HANDLE BAR CAP SCREWS- $15 ea. chrome plated steel, FT227 - $12 ea. 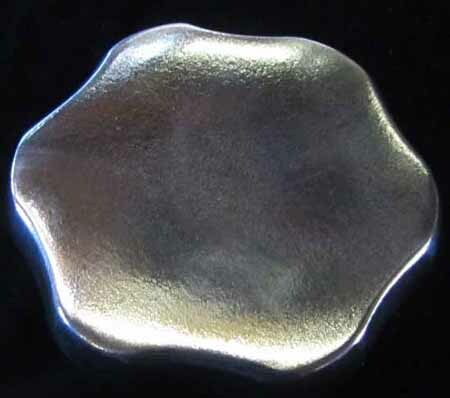 cadmium plated steel. 5/16" CEI. I'm not a fan of stainless steel screws. Yes, I do make the Saint Christopher Medal. 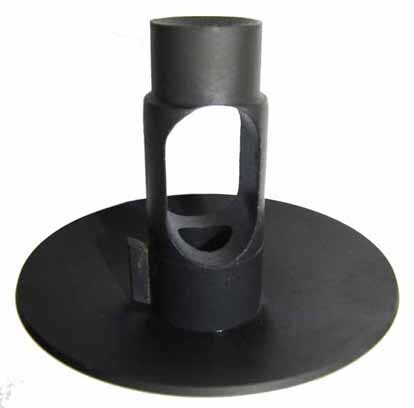 FT229 - BRAMPTON TOP RACE CONE SHROUD- $60, available only with complete fork sets, PR30MB. One of the very few fully machined parts I will ever manufacture. No one else is making them and they are essential in supplying a complete Brampton Fork Assy. The bearing actually fit in these. No additional fitting required. Another one of those parts that are not actually available from any source we could find. Brampton Twins and Singles. These are Parkerized steel, OEM parts were painted black. Rods are 10+ inches long, Parkerized 4140 steel.